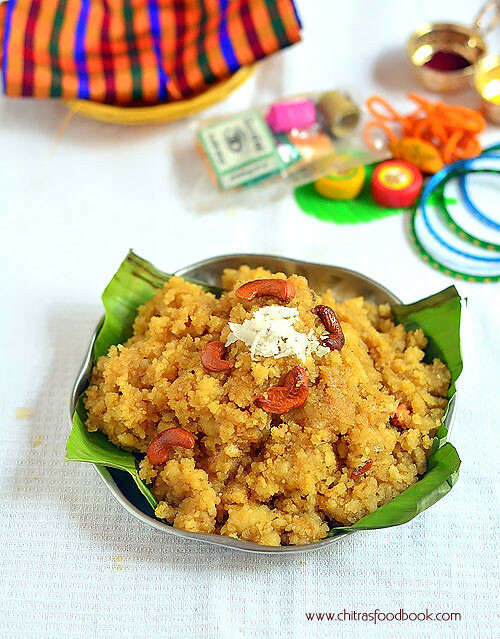 In this post, lets see how to make Thiruvathirai kali, kootu and adai recipes with step by step pictures and video for making thiruvathirai kali. Before that, lets see the significance of Thiruvathirai. Arudhra Darshan or Arudara Darshan is observed in the Tamil month of Margazhi (December – January). In our house, we celebrate this festival by offereing Thiruvathirai kali, adai and 7 kai kootu with mixed vegetables to Lord Shiva. It is essentially a Shaivite festival and celebrates the cosmic dance of Lord Shiva, which is represented by the Nataraja form. Arudra festival is celebrated with fervor in Lord Shiva temples in Tamil Nadu, Sri Lanka, Singapore, Malaysia, South Africa, Australia and in other parts of the world by Tamil speaking population. Arudhra signifies the golden red flame and Shiva performs in the form of this red-flamed light. 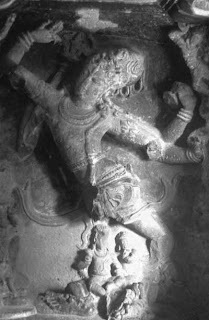 The cosmic dance of Lord Shiva represents five activities – Creation, Protection, Destruction, Embodiment and Release. In essence, it represents the continuous cycle of creation and destruction.Arudra Darshan celebrates this ecstatic dance of Lord Shiva. It takes place on the full moon night in the month of Margazhi and this is also the longest night in a year. The festival is mainly observed in the Tamil speaking world.The most important Arudhra Darshan festival takes place at the Chidambaram Shiva Temple in Tamil Nadu. Most of the temples around the world with Lord Nataraja as deity perform the Arudhra Darshan. As per the Puranaas, on this day Lord Shiva has shown this blissful dance that energizes this world to two of his devotees - Vyagrapadha and Adisesha (on whom Lord Vishnu Reside). Hence this day is celebrated, in appreciation of the cosmic dance of Lord Shiva, by offering Prayers to the Nataraja aspect of the Lord. Special prayers are held on the day at all Shiva temples. Milk, honey, water, sandal paste and other cooling liquids are offered to Lord Shiva on this day. This is to cool a burning and turbulent Shiva who is performing the Tandava – the cosmic dance of Nataraja.Special abhishekam, rituals and celebrations are held on the night of Thiruvathirai. 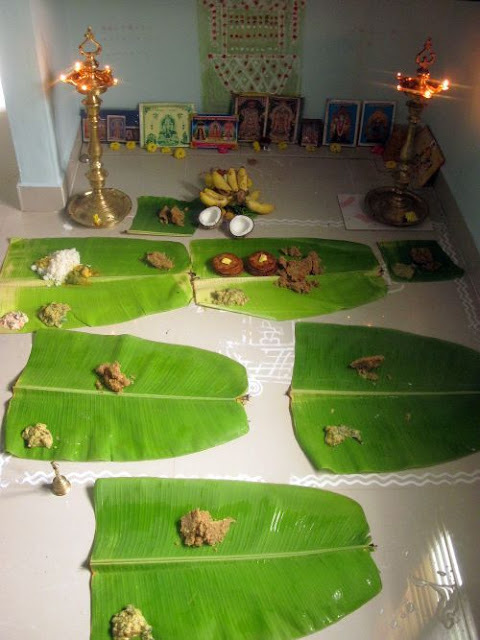 In our house, we celebrate this festival by offering kali ,kootu and adai to Lord Nataraja.We tie a yellow rope in our hands.We also draw maakolam all over our house.My MIL draws a procession car(Thaer)with shivalingam in the center and keep it in Pooja room as idol .I’ve attached the photo of our Pooja room with all the offerings in the end of this page! !Do have a look. Please check THIS LINK for latest kali recipe with video. Please watch the video link given above for clear understanding ! Dry roast the moong dhal in a hot kadai till light golden brown(nice aroma comes).Set aside. Dry roast the rice in the same hot kadai till it puffs up slightly. Now grind the rice& dal in the mixie (Run once or twice.It should be just broken like rava/semolina). Pressure cook rice and moong dal with the nentioned quantity of water & a drop of oil.cook it for 1-2 whistles(rice should be separate).It shouldn’t be overcooked.Rice should be fluffy and separate..Set aside.No problem if the rice is slightly mushy. When it cools down,it will be separate.. Break the jaggery into pieces.Run the grated coconut in the mixie once or twice.Now take a bowl with the jaggery and put in very little water(should immerse). Melt and make a syrup by keeping in medium flame .This is done to remove mud and stones in jaggery.After we make the syrup,strain it in a metal strainer. Now add the cooked rice to the syrup and a tsp of ghee.Mix well by keeping on the medium flame.Take care to stir continuously,so as not to charr. It gets thicken and rice will absorb all the syrup.Lastly add the grated coconut and fried cashews along with ghee.Switch off the flame. Note : Instead of making jaggery syrup , u can directly add the jaggery & grated coconut to the rice mixture if ur jaggery is pure. Shelf life : fresh or for 1 day. Wash and Soak rice in water for 2 hrs. Drain the water and Spread the rice in a paper or cloth for 5-10 mins .Water content gets absorbed and rice will become dry with little moisture.Now grind it in the mixie till it becomes a nice powder.Add cardamom with the rice so that it will be grinded nicely. Now sieve the rice flour and remove the coarse ones.Fry it in the dry kadai till vapour comes slightly. Set aside.Dry grind the coconut and keep apart. For ready made rice flour ,dry roast till vapour comes slightly.Do it for 1-2 minutes in medium flame. Please don’t roast too much as the adai may break. Remove as soon as vapour comes out.Now take the jaggery in a bowl & add 1 cup of water.Melt & strain the jaggery.Let it boil for sometime.Now simmer the flame and add the rice flour, cardamom powder and the grated coconut.Mix it well. Make sure there are no lumps .The mixture will become thick and all the water gets absorbed into the rice flour. Remove from the flame and let it warm.Grease ur hands with oil and knead well to make it soft.. Make balls of even size. Take a small polythene sheet or Plantain leaf .Spread the ball with hands and make it like Poori. We usually keep 7 nos for neivedyam ..
Heat a dosa tawa .Sprinkle some oil/ghee and put the adai into it.Cook till it becomes light golden brown. Cook it in med flame.Adai should not break. So cook carefully. Flip it once. cook for sometime and enjoy eating hot!! I always use home made processed rice flour to make soft adai. Sufficient quantity of water should be added while making the syrup. Do not flip the adai very often as it may break. If the dough is sticky,grease ur hands with oil and pat the dough.Use oil generously whenever needed. Cut all the vegetables and tomato in even size. Pressure cook the vegetables ,tomato by adding dal,required salt and water . (Vegetables shouldn’t be mashed or overcooked).Keep it in high flame for 2 whistles.It will be perfectly cooked. Grind the coconut with green chilly and a tsp of rice flour to make a paste by adding water. Add jeera at the end and run once. Add the ground mixture to the cooked veggies by keeping on the flame.Boil well for few minutes till it thickens .Adjust the consistency by adding water if required..
Heat a kadai with a tbsp of coconut oil and temper with mustard,urad dal and curry leaves and add to the above mixture. Delicious , healthy veg. kootu is ready! !Enjoy with kali or plain rice ! For the above recipe, I used 1/2 raw banana, 2 small colocasia, 1/4 piece of yam, 10 broad beans, 1/2 cup of cubed ash gourd and 1/2 sweet potato small sized, handful of mochai kottai. U can also use other country vegetables like cluster beans, bittergourd, ladies finger, pumpkin etc to replace the above said vegetables. Last but not the least,Here is our pooja room picture..
Hope you all enjoyed reading our thiruvathirai celebration. May the Lord bless us with all happiness and fortune!! hey such a wonderful post... gr8 yar... thanks for visiting my blog and lovely comment. Rice kali and adai is new to me...shall give a try for sure..u have great info on nutrients too...good job!!! Thanks for calling me here! I really liked all the info you have posted, and the photos of puja room, kolams, sharadu and so on. It is a great way to learn all about our tradition! I like the Kitchen Clinic concept as well! Will be a frequent visitor now! Rice adai is new to me...I loved your kali recipe..will try your way sometime.. Thank you for dropping by my place and getting me introduced to your blog. Nice and yummy recipes. Deliciously long post with all tempting recipes....Will revisit soon.... Are you from Bangalore? Very nice and informative post. First time here. u have a nice blog.